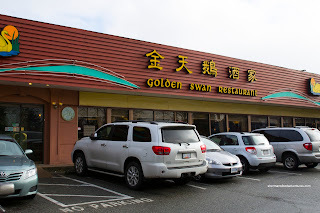 I'm sure it is not lost upon many of you that I've been revisiting restaurants that I originally tried earlier on in the life of this blog. 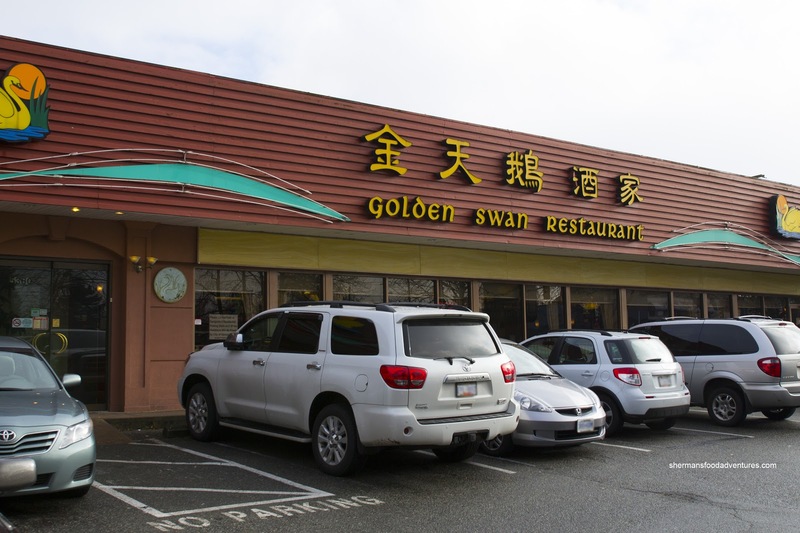 No, I'm not running out of restaurants, rather, some of these establishments have gone through ownership changes such as Golden Swan. I've been there for dinner 3 times since the change, but have never been back for Dim Sum. Therefore, this was as good as any other time to do another visit. Joining us was Goose, Mrs. Goose, their kids and the grandparents, which would ensure a large array of dishes. Also, with the ever-rare push carts hawking their wares, it would be easy to over-order (which we did...). So, not much has changed since the ownership change in terms of decor, but I heard some of the kitchen staff and front-of-the-house are different. 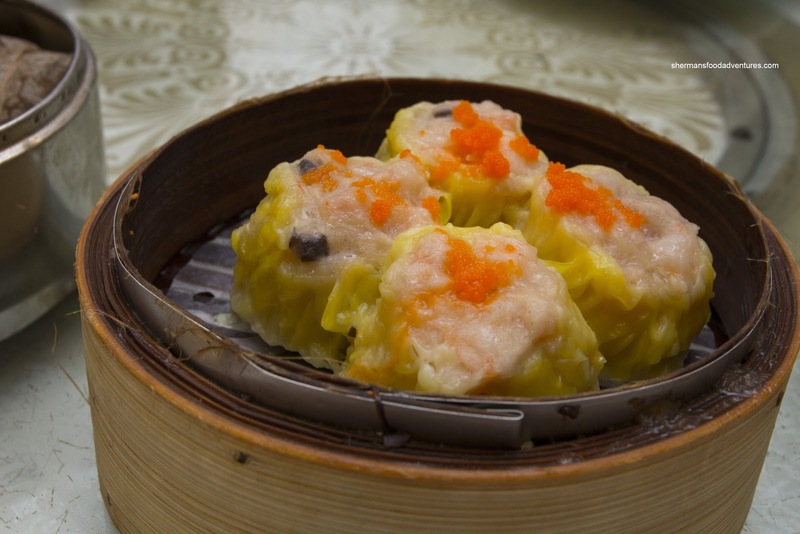 One thing that hasn't changed are the pushy Dim Sum ladies trying to get you to order something you don't want (they might look into changing that...). The first item to hit the lazy Susan was the Sui Mai (Pork & Shrimp Dumplings) which was aesthetically-pleasing, but the chewy and fatty pork made the dumpling unappealing. It was on the blander side as well. Too bad really since the ample shrimp was sweet and had a nice snap as well as the bits of shiitake mushroom. Next up was the Lo Mei Gai (sticky rice wrapped in lotus leaves) where the rice was chewy yet moist. 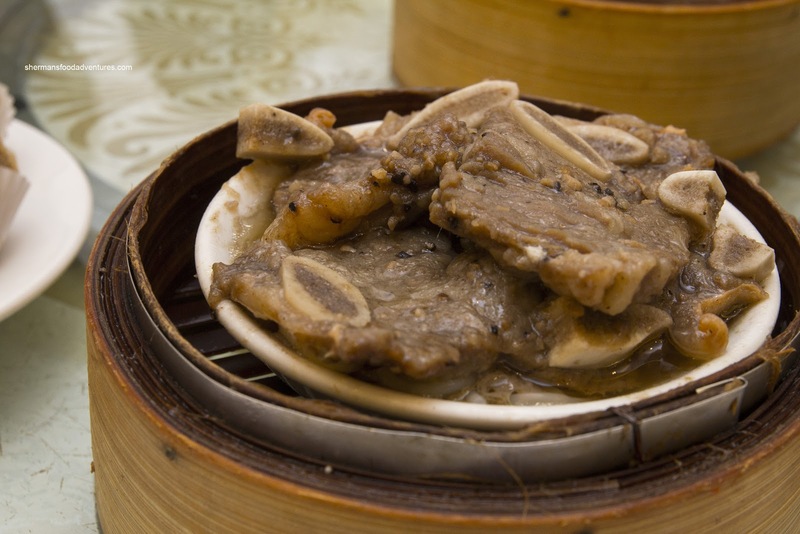 There was a considerable amount of filling which was full of tender, flavourful ground pork and shiitake mushrooms. A dish I normally do not order, but did this time (due to the power of suggestion of the Dim Sum cart lady) was the Beef Short Ribs. The reason I avoid this particular item is that the meat can be pretty chewy and fatty. Not in this case though as the ribs were meaty, tenderized enough and not too fatty. However, the entire dish was lacking in flavour with little in the way of black pepper, garlic or even salt. 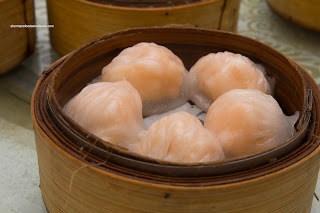 When the Haw Gow (Shrimp Dumplings) were placed on the table, we were surprised to find 5 of them in the bamboo steamer. I've always made the argument that a family of 5 would always lose during Dim Sum because 4 is the magic number of items on a plate. I'd better stay away from here to maintain my family of 4!!! 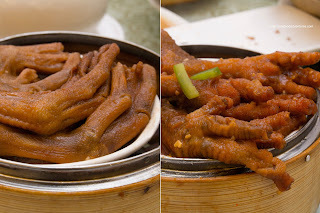 These were pretty good with a thin dumpling skin which was a bit wet. This was due to the shrimp filling being moist (and probably too wet). The filling itself was sweet and mild with a nice snap. But it could've done without the extra moisture. Onto another shrimp dish was the Shrimp Mousse- Stuffed Eggplant. 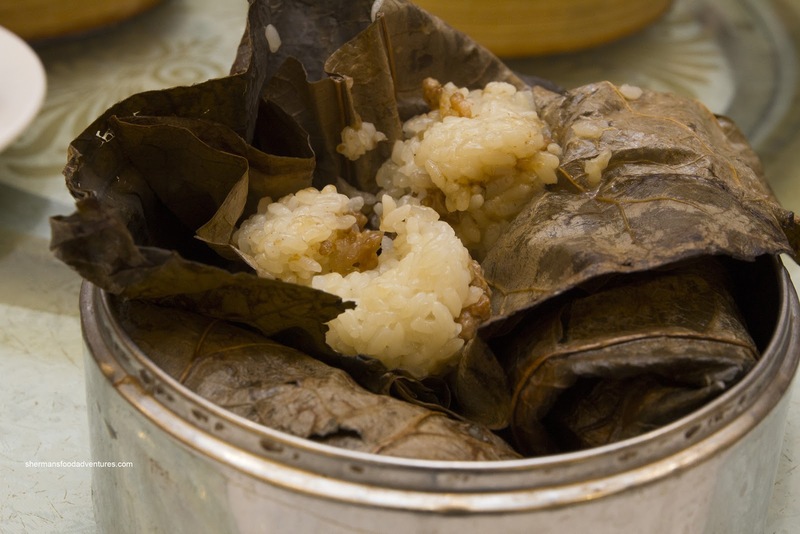 Once again, the shrimp filling was moist and wet, er... sorry, no other way to put it! On the bright side, no one would complain that the filling was dry or lacked texture. 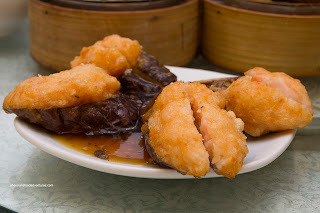 The filling was barely cooked where the shrimp had a nice snap. There was just enough seasoning to accent the natural flavour of the shrimp. When the "offal & congee" cart passed by, they didn't need to sell me on their wares like a Sham Wow at the PNE Showmart. I immediately motioned for both of the items. 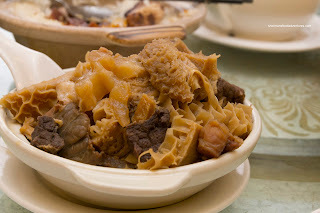 The Assorted Offal was a bit pale for my tastes, but this was obviously not the rich stewed version. Hence, the flavours were not developed, neither were the textures. The tripe was chewy and hard while the tendon and lung were acceptable. The Preserved Egg & Salted Pork Congee was much better as it exhibited a "home-made" quality. It was really thick and had a rich slow-cooked flavour. I'm sure there was some MSG, but it wasn't too heavy. 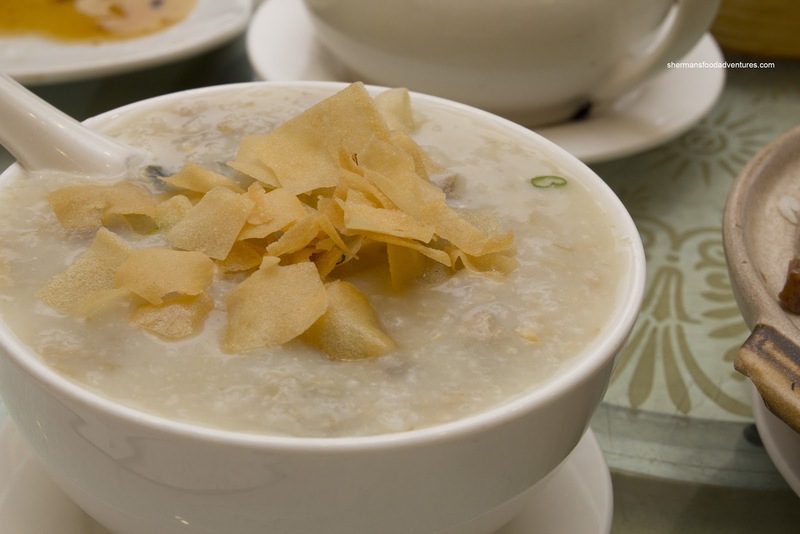 There was an ample amount of ingredients, but the egg was in little bits as it was cooked in the congee and dissolved (hence the rich flavour). The salted pork was shredded to bits and was mostly a garnish despite being plentiful. Another item I cannot do without at any Dim Sum meal is rice noodle rolls. Therefore, we got both the Shrimp Rice Noodle Roll and the Ja Leun (Salty Donut Rice Noodle Roll). The rice noodle was quite thick, yet still soft. 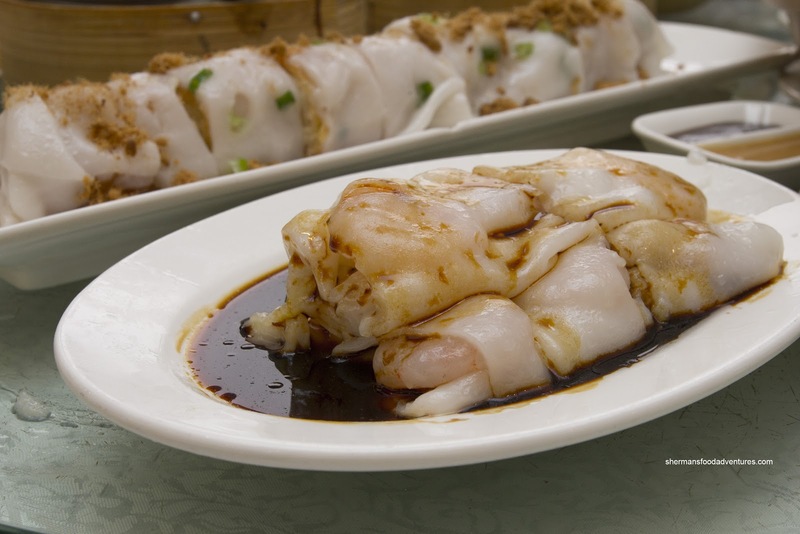 The large cold-water shrimp were crunchy, hence devoid of any natural sweetness. Despite this, the rice noodle roll was good. As for the Ja Leun, the salty donut was too dense and not really all that crispy, which negated what makes the dish good (which is a contrast of textures). 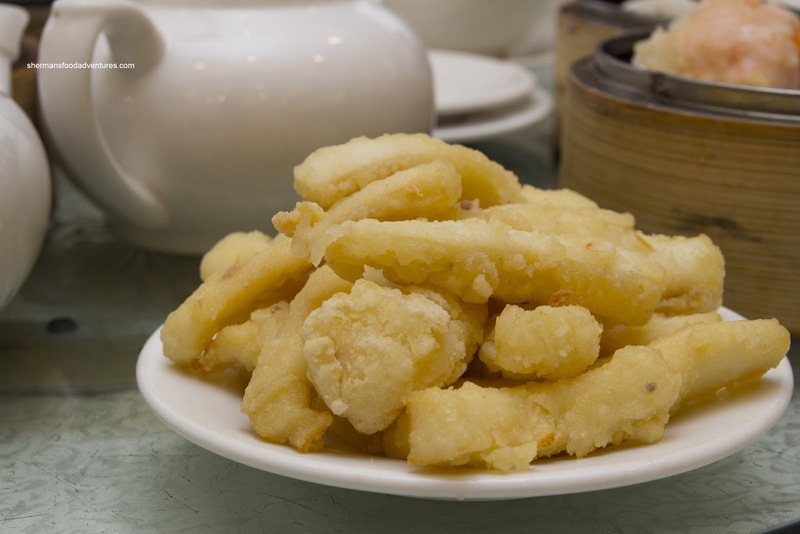 On the topic of textures, the Fried Squid was not as crispy as we would've liked. This could've been due to the time it sat on the push cart until it got to our table. The large cuts of squid were meaty and sweet with a significant amount of chew (yet not being chewy per se). I liked how the batter was not oversalted, hence we could actually taste the mild squid. From squid to feet, in particular Duck Webs and Chicken Feet, we had them both. I remember my grandma once saying that eating them would make me run faster. I fail to see the logic when eating copious amounts of fowl feet would make me fat, thus making me run significantly slower! Anyways, both were pretty good with mostly intact fried skin and a decent amount of gelatin and soft cartilage underneath. For our "fillers" we had 2 hot pot rice offerings including the Meat Patty with Egg and Cured Meats and Taro. The rice took awhile to arrive since they actually cooked it in the hot pots. 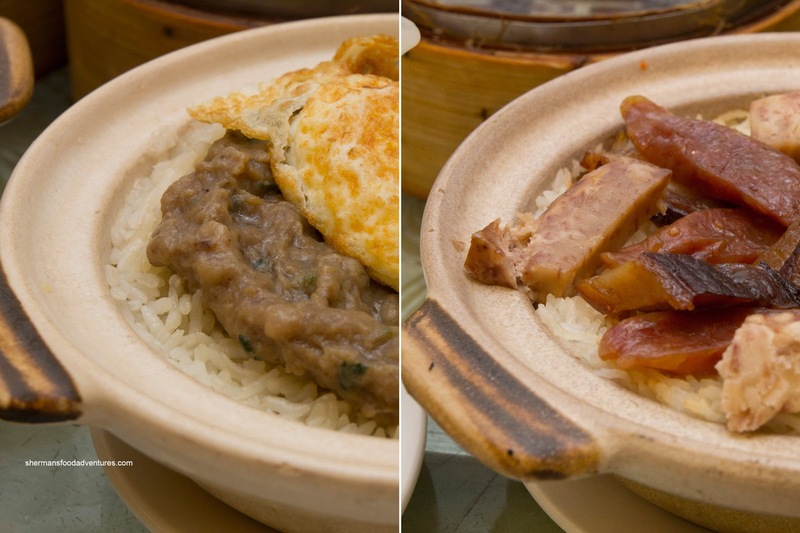 Hence, the rice was chewy and nutty. The meat patty had a good bounce and had a good balance of flavours. The cured meats (Chinese sausage and pork belly) were pretty standard while the taro was a bit perplexing to me since it was starch on starch. 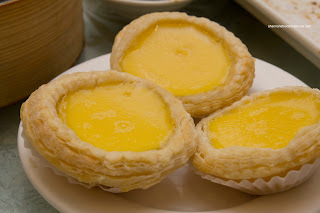 We had a few more dishes that were not particularly exciting (yet still decent), but I'll skip directly to the Egg Tarts, which incidentally we got at the end of our meal (which is rare at Dim Sum). They were hot out of the oven with a flaky shell, but curiously pale in colour. The egg custard was a bit stiff and somewhat bland. When we got the bill, it was not as bad as we had expected given the amount of food we had ordered. Overall, the food was alright with some highlights. However, my pick would still be Western Lake a few blocks down.